Comet 212631A. Red Cam Spring for Comet 94C "Duster" Clutches. 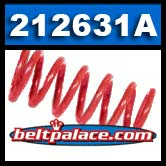 OEM PART: 212631A, SPRING-RED 94C (1-9/16" OD). Genuine Comet Industries part made in USA! Fits 206095A, 206097A/206096A, 209739A, 212629A, 213051A Models.